And that she did. Screen printing took Perra to residencies in far-flung places, including Alaska, the Faroe Islands, and Iceland. Perra just returned from Thingeyri, Iceland, where she worked on a documentary project about arctic fox researchers and hunters, an experience that inspired many of her recent pieces. Much of Perra’s work features animals in the wild, as screen prints, paintings, and even gyotaku-style relief prints made by inking a plant or animal surface directly to create a one-of-a-kind image. Screen printing’s complex process appeals to Perra. She builds as many as fifteen layers off of a base illustration, each one adding depth, nuance, and detail. A scientist at heart, Perra’s process isn’t so different than that of a field researcher. The type of screen printing Perra does requires UV light to set, a technique that requires expensive and specialized equipment not practical for a home studio. Like a scientist returning to her lab, Perra takes copious sketches in the field, mocking out designs that she prints during concentrated sessions at a mentor’s studio in Vancouver, B.C. The results are meticulously crafted prints imbued with the wildness that inspired them. 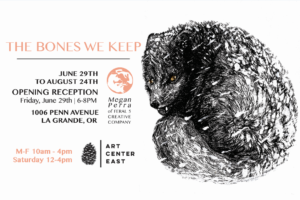 In addition to pieces from her recent trip to Iceland, The Bones We Keep will feature work from Perra’s residencies in Alaska and the Faroe Islands. She will also create an original mural on the Art Center East gallery walls. The public is welcome to observe her install the mural on June 25-28, 10:00am-Noon or 3:00-4:00pm. 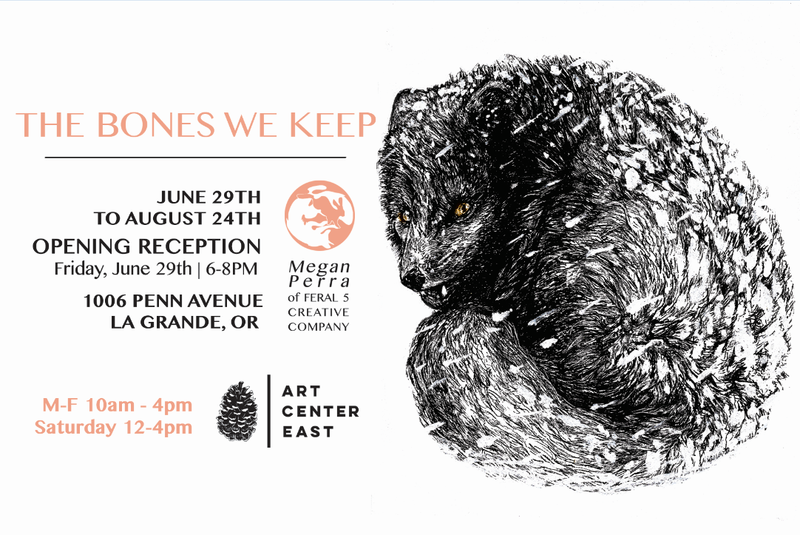 The Bones We Keep opens Friday, June 29 from 6:00-8:00pm. Listen to a podcast about arctic foxes that Megan produced during her time in Iceland here, and read an article she wrote for Sierra Magazine describing a research expedition north of Sitka, Alaska here.